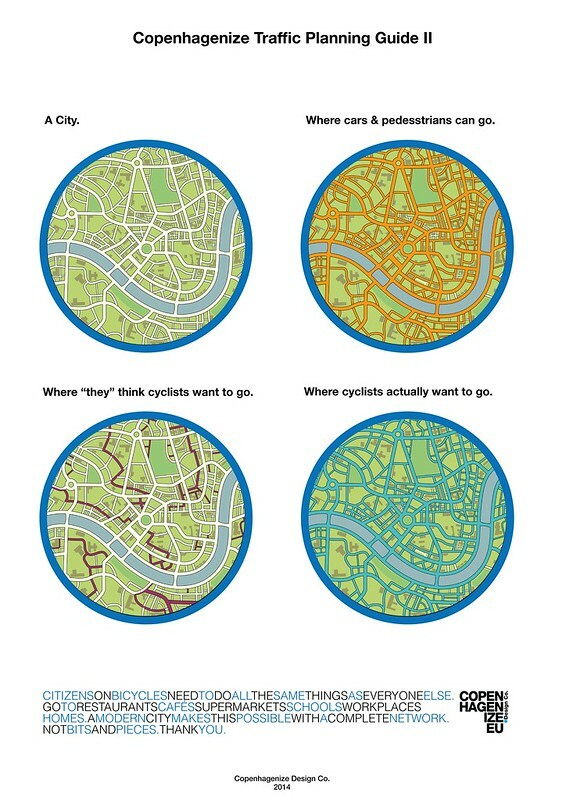 Copenhagenize.com - Bicycle Urbanism by Design: Where Do You Want to Go? Things are changing, no doubt about it. All over the world. Like in every paradigm shift there are cities that move fast, cities that try to play catch up and cities that are still tying their shoelaces in the starting blocks. One of the primary challenges that remains is the perception of who infrastructure is for. I meet many politicians and planners around the world who clearly think that they are expected to provide safe infrastructure for the few people riding bicycles in their city right now. They fail to understand that they should be building infrastructure for all the citizens who COULD be riding a bicycle if they felt safe on a complete network of infrastructure. The Zeros to Heroes cities that are way ahead of the curve - for example Barcelona, Seville, Dublin, Bordeaux, Paris, Buenos Aires - have just rolled up their sleeves and built infrastructure. Infrastructure that actually reflects where the citizens want to go in a city. Which is basically the same as where everyone else wants to go. In many other cities, bits and pieces of infrastructure are put in where it won't bother the motorised traffic too much. Often such bits and pieces are launched with much fanfare. "See! We are thinking about bicycles!" Even though the bits and pieces are symbolic gestures that do little to reestablish the bicycle as transport on the urban landscape. Here in 2014, after seven or eight years since the bicycle returned to the public consciousness, there are only 370 km of protected bicycle infrastructure in all of the United States, compared to 1000 km in Greater Copenhagen alone. What I often see around the world is attempts by cities to put cyclists where they want them to ride, based on false assumptions that this is want cyclists also want. "Ooh, those cyclists must really want to ride on quiet roads, away from traffic.... yeah... that's what they want." Then follows symbolic routes following all the vague principles of detours. Citizen Cyclists are sent out of the way of basically everywhere that city-dwellers want to go. Shops, businesses, restaurants, cafés, cinemas, workplaces. The existing, historical Desire Lines of a city - aka roads - remain the domain of automobiles. While Copenhagen may be "all that" these days, mistakes have been made. Lessons have been learned. Back in the 1980s when citizens were returning to the bicycle thanks to the reestablishment of cycle tracks, the City learned a valuable lesson. Cyclists were following the busy streets to get to and from the city centre. Normal behaviour for homo sapiens. The City decided that this couldn't possibly be what they wanted. They assume cycling citizens wanted quiet routes, even if it meant they would have to go a bit out of they way. They constructed a pilot project route roughly parallel to Nørrebrogade - along Guldbergsgade - that they were sure would please the cycling citizens. It was a flop. A2Bism will dictate that people want to travel along the most direct Desire Line, regardless of transport form. To the City of Copenhagen's credit, they respected this simple anthropological desire and started building cycle tracks along the pre-existing Desire Routes - the main arteries leading the city centre. If you live in a car-dominated city you might be pleased with symbolic municipal gestures like "bicycle boulevards" or whatever they call them, or bits of narrow "bike lanes". You are, however, being handed the short end of the stick. Bicycle urbanism may be a phrase I coined but the principles have existed since cities first were formed. Best Practice is right there, for the taking. With a bit of balance you might be able to rest your weary bones on a two-legged chair. Definately better than no chair. But four-legged chairs are on the market. Demand them.